What is the Seal of Biliteracy, and why is it so important? The Seal of Biliteracy is the award given by a school district or a school to the students who attain a high level of language proficiency. The award is given on a voluntary basis. Students need to achieve proficiency at least in two languages, one of which must be English. The Seal of Biliteracy appears on their transcript or diploma of a graduating senior. The Seal of Biliteracy was originally introduced in California in 2008 by a coalition of parents, teachers and education advocates. Today it is in twenty four states such as Illinois, New York, Minnesota, California, Florida. Several others are working on its implementation. The Seal of Biliteracy is recognized by employers as a sign of multilingualism and is often honored by colleges and universities for college credits. Why do we need the Seal of Biliteracy? Don’t we have outstanding Polish language proficiency tests already in use? Currently Polonia has two excellent language tests. One was prepared by Columbia University and another by M. Curie-Sklodowska University in Lublin. They are excellent, exceptionally high quality tests. Unfortunately, they are not recognized by all American educational organizations. American educational organizations require all language tests to be developed by nationally recognized assessment test developers. This insures that all tests are consistently developed. Currently nationally recognized tests have been developed and are in use for Arabic, French, German, Hebrew, Italian, Japanese, Mandarin Chinese, Russian, Portuguese, Spanish etc. There is no such a developed test for Polish language. Once a test for Polish is developed by one of these recognized language assessment institutions, it will be automatically accepted by all states that have the Seal of Biliteracy. How does preparation for the Seal of Biliteracy differ from the preparation that Polish language schools are doing today? There is no difference in preparation and no change in the school’s curriculum. The Seal of Biliteracy’s goal is to measure proficiency in everyday communication. This measures the same general knowledge that our students receive at Polish language schools and often use in their everyday communication at home. This will allow them to pass this test without any problem. The test for the Seal of Biliteracy consists of four categories: speaking, listening, reading and writing. The combination of learning at Polish schools and communicating in Polish language at home creates an immersion program that is so effective in learning Polish. What are benefits of the Seal of Biliteracy for Polish language students and Polonia in general? First, there are many known cognitive benefits of being bilingual such as improved memory and attention, problem-solving capabilities, primary-language comprehension and ability to empathize with other cultures and people, more effective communication. Second, Polish language under the Seal of Biliteracy will be recognized by American educational organizations on the same level as other languages taught at American schools. Polish language students will be awarded for their proficiency in our language. They will be able to receive college credits. In our global world bilingualism is increasingly recognized by employers. Achieving fluency in Polish helps in learning another language such as Spanish or German, etc. There also will be more interest in learning Polish as a second language and this will increase the interest in attending Polish language schools. Who is going to prepare the test and how much will it cost? I have been working on the selection of a nationally recognized institution that can offer us the best conditions and price for the test. The test will be prepared by American language assessing institution that has been developing nationally recognized language tests since 2001. The organization we are considering offers already tests for several other languages and its tests are on the language list in all states. The cost of the test development is $30,000 and Polish community needs to purchase 500 copies in the year of its release, $25 per each test. The test should be available in spring 2018 and the exact date will be known soon. We have five months to collect money for the project. While I already have one very generous sponsor who offered me $5000, I need help from other Polish organizations and individuals to support the project. I hope that Polonia understands the value of the Polish test for the good of Polish language students. Polish educational portal, Dobra Polska Szkoła, published the interview with me about the Seal of Biliteracy and the Polish language test. The interest and approval of the project from different regions were huge. In 48 hours over 1,000 people read the article and many of them left positive comments. People who are interested in the project can find the detailed presentation on The Polish Mission website: http://www.polishmission.com/. For those who want to help financially, please send contribution by a check to The Polish Mission (write Biliteracy Polish Test in a lower right corner of the check, its address you will find below) or by making donation online www.polishmission.com by choosing destination: Polish Biliteracy Test. Every contribution will be deeply appreciated. I believe that a standardized computer assessment test for the Polish language will greatly benefit the Polish community, our language will be recognized at the national level, drawing more interest for Polish language schools and promotion of Polish language, history and culture. I talked to people responsible for tests for Seal of Biliteracy at the Department of Education from Illinois, New York, Minnesota and Wisconsin and all of them told me that the test is much needed for the Polish community. That is why I am asking for full support in raising funds to cover the cost of exam. 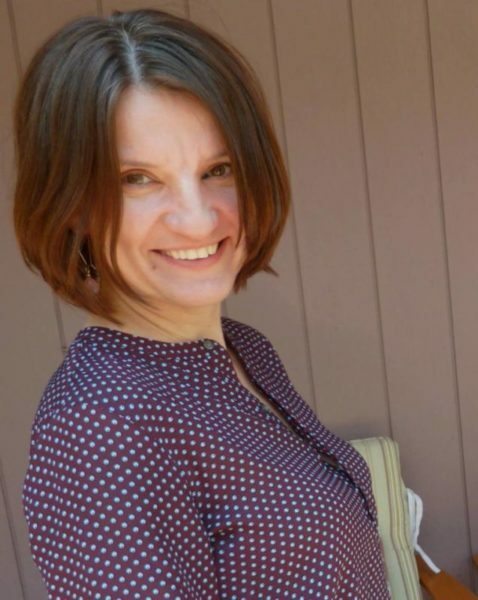 Marzanna Owinski has a Master’s degree in Polish language from Warsaw University, and a Master’s degree in PR and Organizational Communication from Wayne State University. She is a principal of Father Jozef Dabrowski Polish Language School in Orchard Lake. A certified teacher in Polish language in Michigan, she teaches Polish at St. Mary’s Preparatory, a catholic high school. She also teaches Polish as second language to students age 6-13 and adults. Since summer of 2016, Owinski has worked as a Polish Language Coordinator for The Polish Mission.